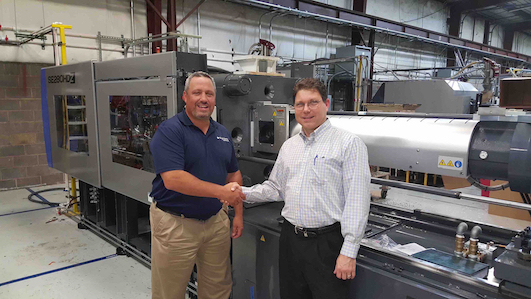 GreenLeaf Industries, based in Lenoir City, TN, has announced the installation of a new, all electric, plastic injection molding machine in their manufacturing facility. The company is a provider of custom plastic injection molding design and manufacturing services. Lawrence Segrest, CEO of the company states, "We are proud to announce the installation of our all new electric plastic injection molding machine. We always strive to provide our clients with the best services in the industry, and we believe that this new equipment will help us to meet those goals." Segrest says that those interested can read about the new equipment on the company's official website. GreenLeaf is an ISO Certified company that is family owned and operated by two generations of professional engineers. Established in 1999, the company provides quality craftsmanship to a number of businesses and industries in East Tennessee and the surrounding areas. "We invite everyone to learn more about our plastic injection molding services," states Segrest. "We want you to be completely sure that you have chosen the right company to work with, and we think that once you see our credentials, you will feel positive that we are the perfect choice." Segrest states that the company mission is to provide clients with the highest quality of products at fair prices. He says that the new equipment will not only enable them to provide a higher quality of product, but will help to lessen delivery times, thus offering more affordability for the company and its customers. The company states that their goal is to be the best and most favored supplier in the region. Segrest says that the company always places strong emphasis on hiring only the best individuals in the region and only those who provide innovation and focus. He states that along with quality personnel, the company strives to always ensure they are working with quality machinery, hence the reason, he states, for the new molding machine. Those interested in the specific services provided by the company or in the equipment that they use, can learn more about GreenLeaf Industries by visiting them on their official website.